Rainbow of Roses Collection | Gardens Alive! If you've always adored roses from afar, but thought they were too hard to grow, now might be the time to reconsider this fragrant, timeless beauty. Modern roses have been bred to be more resistant to insects and disease than older rose varieties, which means you can add their charm to your garden minus the worry or work of roses past. Not sure which color you like best? 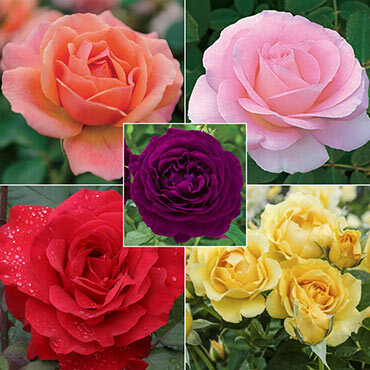 Why not start with our Rainbow of Roses Collection—it includes one each of a pink, red, yellow, orange and purple rose. The varieties may vary with each collection, but each bareroot rose is tagged by cultivar so you'll know exactly which is which. And as always, each rose comes with a 100% Satisfaction Guarantee.